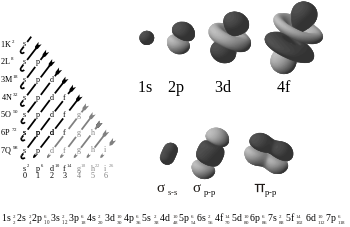 An electron shell is the set of allowed states that share the same principal quantum number, n (the number before the letter in the orbital label), that electrons may occupy. An atom's nth electron shell can accommodate 2n2 electrons, e.g. the first shell can accommodate 2 electrons, the second shell 8 electrons, and the third shell 18 electrons. The factor of two arises because the allowed states are doubled due to electron spin—each atomic orbital admits up to two otherwise identical electrons with opposite spin, one with a spin +1/2 (usually denoted by an up-arrow) and one with a spin −1/2 (with a down-arrow). As an example, the ground state configuration of the sodium atom is 1s22s22p63s1, as deduced from the Aufbau principle (see below). The first excited state is obtained by promoting a 3s electron to the 3p orbital, to obtain the 1s22s22p63p configuration, abbreviated as the 3p level. Atoms can move from one configuration to another by absorbing or emitting energy. In a sodium-vapor lamp for example, sodium atoms are excited to the 3p level by an electrical discharge, and return to the ground state by emitting yellow light of wavelength 589 nm. ↑ ២,០ ២,១ In formal terms, the quantum numbers n, ℓ and mℓ arise from the fact that the solutions to the time-independent Schrödinger equation for hydrogen-like atoms are based on spherical harmonics. ↑ The similarities in chemical properties and the numerical relationship between the atomic weights of calcium, strontium and barium was first noted by Johann Wolfgang Döbereiner in 1817. ↑ Electrons are identical particles, a fact that is sometimes referred to as "indistinguishability of electrons". A one-electron solution to a many-electron system would imply that the electrons could be distinguished from one another, and there is strong experimental evidence that they can't be. The exact solution of a many-electron system is a n-body problem with n ≥ 3 (the nucleus counts as one of the "bodies"): such problems have evaded analytical solution since at least the time of Euler. ↑ There are some cases in the second and third series where the electron remains in an s-orbital. ↑ The labels are written in lowercase to indicate that they correspond to one-electron functions. They are numbered consecutively for each symmetry type (irreducible representation in the character table of the point group for the molecule), starting from the orbital of lowest energy for that type.